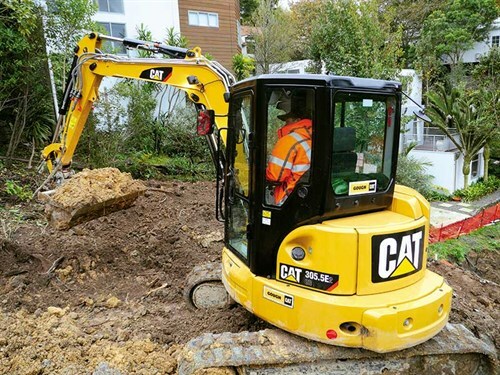 A few weeks back, a mate of mine called to boast that he had just been given the keys to a brand new Cat 305.5E2 CR excavator. He was adamant that I get over and take some pics before it got dirty. To be fair, he was working on what I am told is the steepest site ever to be developed in the local area, proving to be too difficult for two previous drainage contractors. When the going gets tough, people turn to Caterpillar – or so it seemed in this case. A1 Civil Drainage (2014) Ltd was the company that stepped up to the plate, and took on what is a gutsy undertaking. Despite the somewhat smallish site of what looks like around 5-6000 square-metres, the awkward part is the steep drop-off of the land as it peels away from the knoll at the top. Being situated in central Auckland, I’d hate to think what the price a finished house or apartment is worth here, so understandably every square inch of ground needs to be utilised to its full potential. So, what’s good on an architect’s computer screen needs to be translated to the ‘real world’, and that’s where the decision to purchase a new Caterpillar excavator came into being. 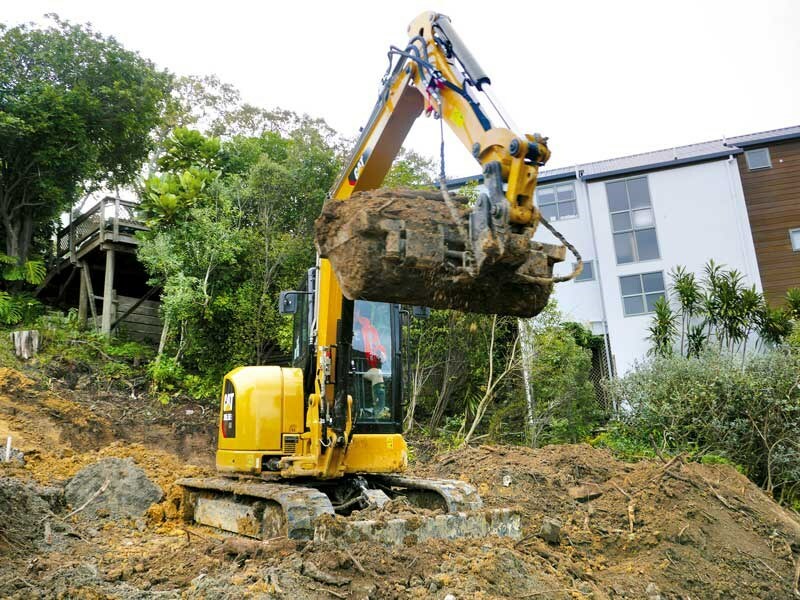 "We did have a fairly good digger already on this site, but to get the work done efficiently and on time, it really required the company owners to invest in a quality machine", says drainlayer/operator John Howard. 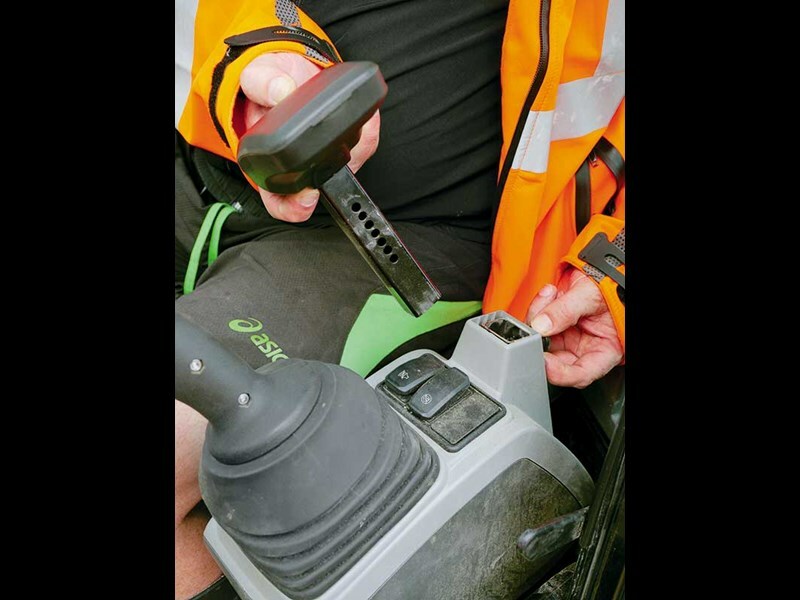 "The last thing we wanted was a machine breaking down – especially on some of the steep grades." Howard is enthusiastic about the new machine, and says that it is putting in long hours to get stage 1 completed before the weather turns. I took the opportunity to jump aboard and see how it performed. With its 32.9kW engine, full cab, and standard arm, the Caterpillar 305.5E2 CR, tips the scales at six tonne. Primarily designed for tight urban work, it features a compact rear-end design that stays within 140mm of the undercarriage. Not quite a zero tail swing, but damn near close. 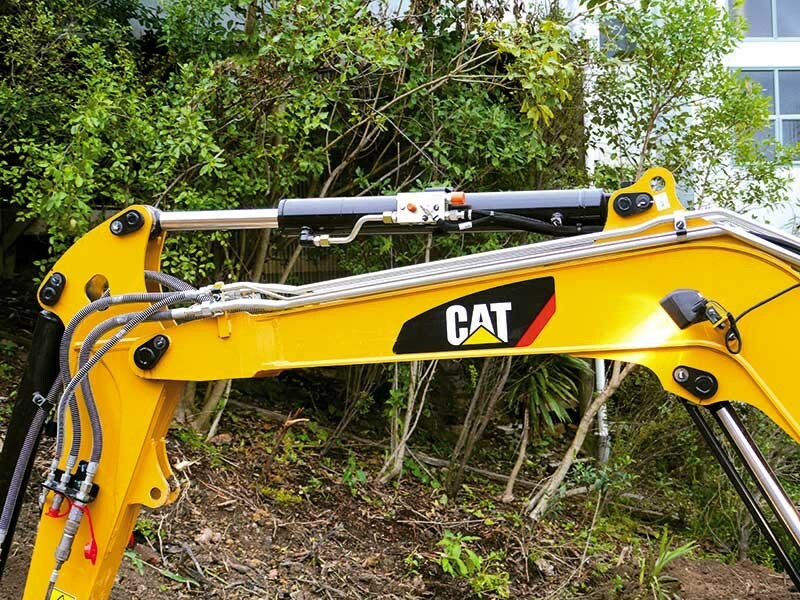 With the standard arm fitted, the operator is able to reach 5630mm at ground level or all the way out to 6020mm with a long arm. Maximum dump height is an impressive 3820mm. Reducing the chances of damage, the door swings fully open and sits back within the outside edge of the counterweight. Cleverly the two-piece glass on the door is flat, being economical to replace if ever damaged. 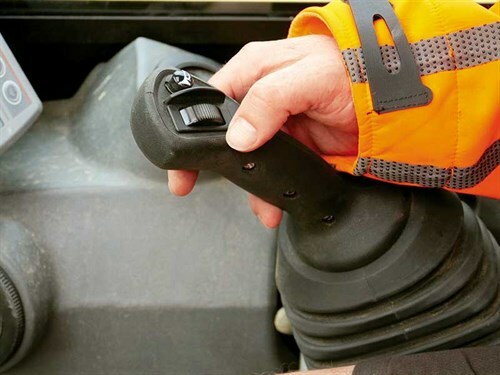 Stepping inside (or out for that matter), becomes less awkward for those wearing shorts, as the control lock-out lever has been re-designed to sit tighter in, and is less likely to catch an operator’s trouser leg. 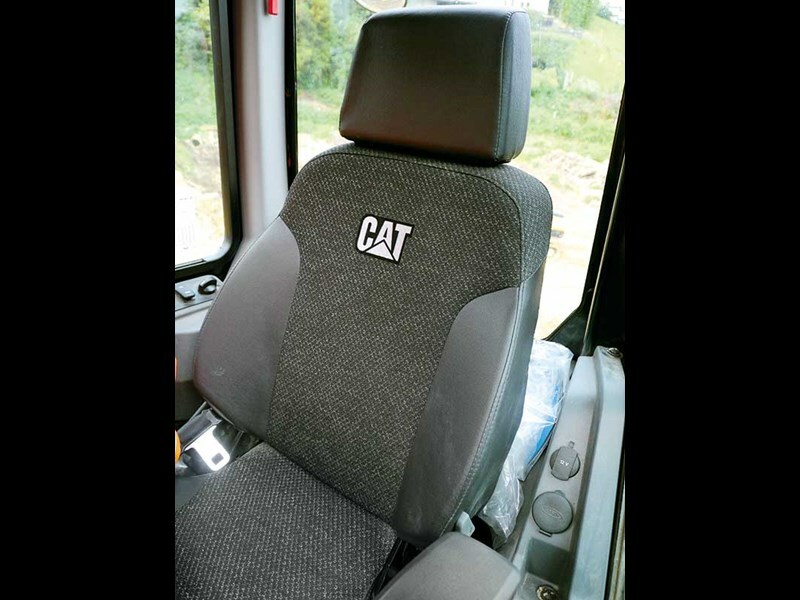 The E2 models also feature new design seats, with Caterpillar obviously putting a lot of thought into making the long hours most operators spend in their cabs more comfortable. Another new feature are the adjustable arm rests. With seven different positions, there should be a comfortable height for just about anyone. 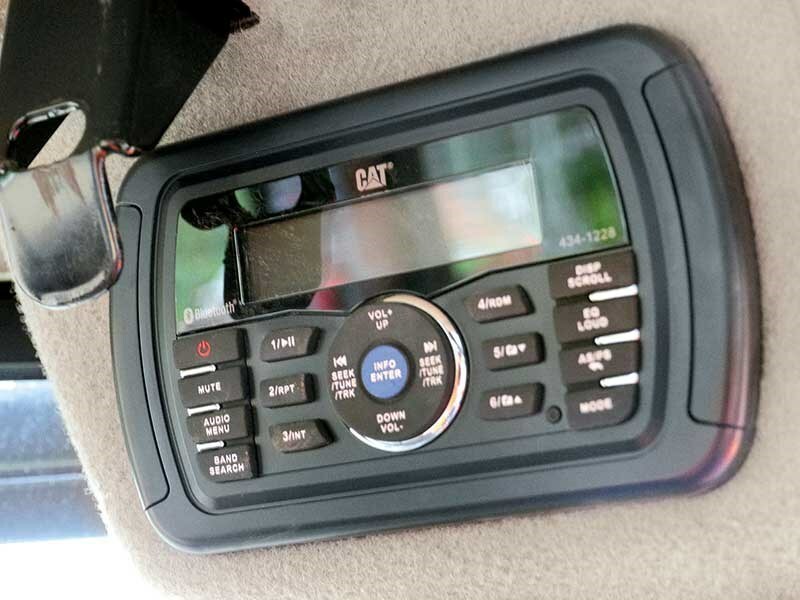 Those who want to keep up with the outside world are also well catered for, with a radio situated above head height on the B-pillar post, a cellphone holder below it, along with auxiliary and USB inputs nearby. This leaves the right-hand side free for the key, throttle and air-con controls. Another big change on this latest model is the front window. The split window system allows a number of different opening options, and is quite ingenious in its design. 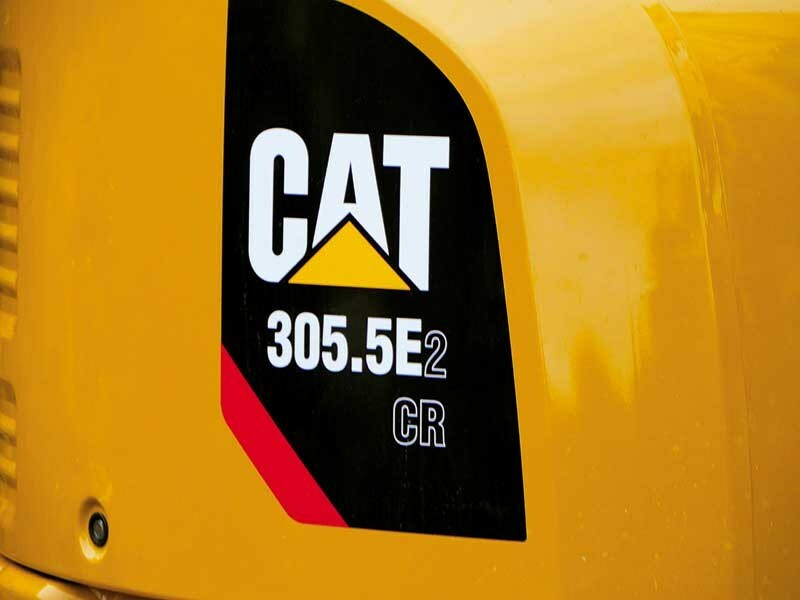 Power to the Cat 305.5E2 CR is supplied by a Cat C2.4 engine, with a rated net power @2200rpm of 32.9kW (44.1hp). 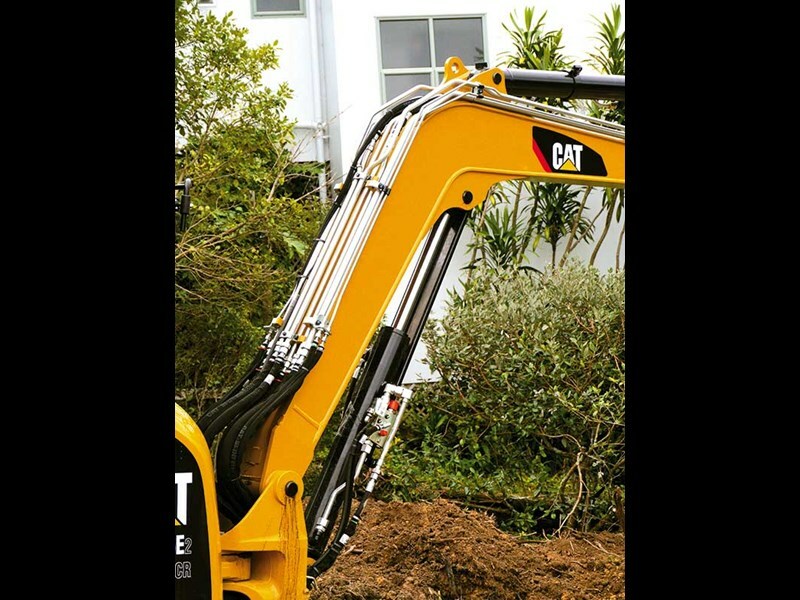 The hydraulics are a new system and feature what Caterpillar calls HDH, or High-Definition-Hydraulics, focussing on a number of different aspects, and which I would sum up as providing ‘precision and efficiency’. Crazy as it may seem, from what I can make out, the valve has been re-designed into a simpler set-up, and therefore operates at a cooler temperature and more efficiently, providing less fuel burn. 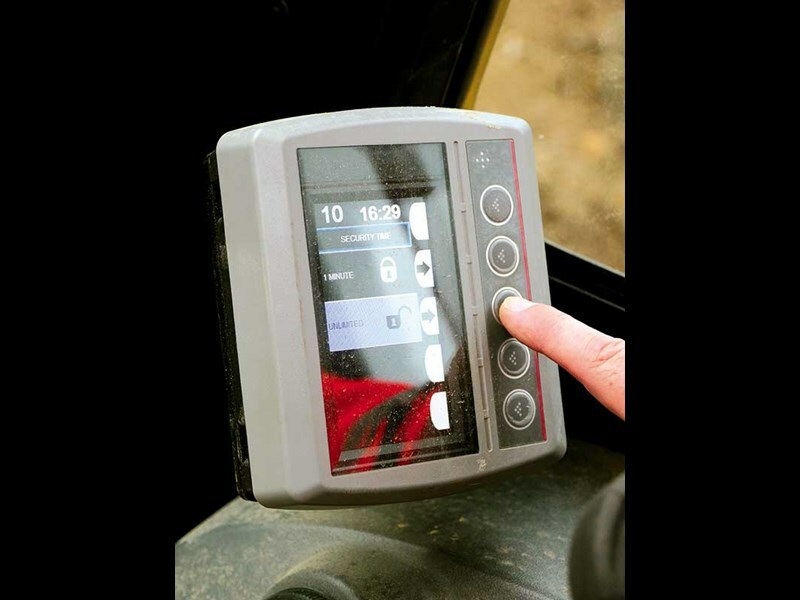 This system has been used in Caterpillar’s eight-tonne machines and is now being rolled out to smaller models. I can see what they say about the access into the cab being a whole lot easier, with the folded back door affording a nice wide area to step in. I’m not entirely sure if the dimensions are any different from the previous model, but with the addition of the re-designed control lock-out lever, it certainly appears that way. The COMPASS display panel (monitor) can be set up for a number of different operators, and entering a personal security code switches things to each individual’s preferences. In my case, it was left on my mate’s settings. After a brief tutorial, I was given the task of moving spoil to make room for a new manhole to be sited. This wasn’t overly exertive work for the machine, but did provide a repetitive operation that gave the arm a good reach workout. I was very impressed with the tilt and side-shift buttons on each joystick, and these coupled with the HDH hydraulic system provided very nice operating conditions. Something else that impressed me was the balance, with the machine not wanting to throw me around as much as one would expect. What I did find was that Caterpillar has put some good practical thought into the 305.5E2 CR. I like how they have simplified things such as the hydraulic system, and gotten really clever with the split front window set-up. I like it, and consider that the directors of A1 Civil Drainage (2014) Ltd, have made a wise purchase. 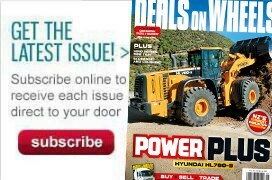 Never miss an issue of the best construction and trucking mag in New Zealand. Subscribe to Deals on Wheels here. 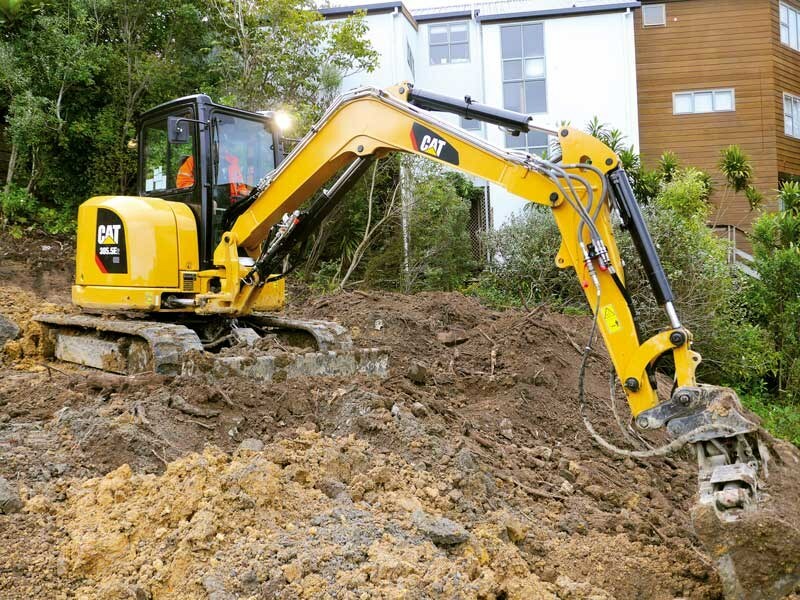 Deals on Wheels sends Josh Simpson to review the new IHI 35V4 excavator. The Ed had the opportunity to get behind the wheel of a Case 1021F. See how he did in this video. Deals on Wheels visits a contractor in Lumsden that uses a Yuchai YC230-8LC excavator.